Yeah I always thought our rear wing looked fairly primitive. Well lots of data gathered and a couple of weeks to finalise the car with the.bits that weren’t ready! For a half baked car we did ok. I’m excited for the first weekend although I just dumped SkyF1 so I will be watching a hooky version on Amazon in German probably!! That,s a nice post but an unrealistic conclusion. The best i see is mixing in the rear of the midfield 7th best team if we are lucky. that is after what we have heard and seen this week from all the teams. Except that, he basically built the same car every year and the concept was rapidly becoming outdated as Mercedes superiority diminished. Also, the issues with that car were becoming a bigger disadvantage each year: it only worked on some tracks, on some surfaces and in the dry. It's also clear that the success masked many of the problems at Williams: the grunt and reliability of the Merc made up for any shortcomings in aero and concerns weren't addressed. In 2016, Pat spent all the money on the new front wing and nose and noted that it 'made no difference whatsoever'. It's impossible to say whether Pat would have been any more or less successful than Paddy at the moment. We had both very good and very bad cars from Sam and Mike in successive years. So it seems like todays rumor that we couldnt ride the kerbs because we risk damaging the car might've been true after all. Edited 1 time(s). Last edit at 01/03/2019 21:29 by Williams-123. And embarrassing end to an embarrassing week. I think the team needs an operations guru before they think of replacing the designer or TD. What's the use of having a nice good desing if they can't get their @#$%& together to actually build it. Last time I mentioned that on this forum, no one agreed with me but I maintained that was the worst mistake Frank ever made and he had no one else to blame but himself. Adrian Newey was irreplaceable. Edited 1 time(s). Last edit at 01/03/2019 22:13 by Gwanni. Well, at least i got one thing right. We didn't go below 1:18s today. Did Adrian have any input in the FW19? I don't if he left to join McLaren prior to it hitting the design tables. Edited 1 time(s). Last edit at 01/03/2019 22:23 by phatjack. Either the top teams sandbagged or the grid will be a lot closer this season. I hope for the latter. yes, the FW19 was the last Williams designed by Adrian Newey, he left at the end of 1996. Williams hasn't won any championship after the FW19. Why I said it was the worst mistake by Frank? Look at how much effort Ron Dennis put in to keep Adrian at McLaren? Similarly, What extent Red Bull did to keep him happy at Red BUll - they knew how important Adrian is to their teaams. But Frank literally invited Adrian to leave with the treatments he got here. Edited 1 time(s). 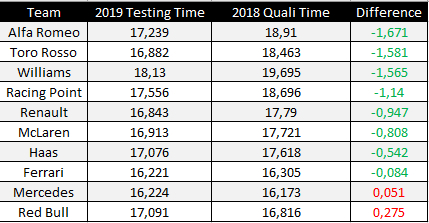 Last edit at 01/03/2019 22:35 by Rosberg. Quote from Adrian Newey himself: "I felt guilty about not coming in, but, having said that, it was December and the design of the FW19 was done. It wouldn't have made much difference whether I'd left in December, January or February...…." I would even say that Williams would have won the 2014 WDC & WCC if they had an Adrian Newey designed chassis...the 2014 Williams engine was awesome but the chassis was not good enough to win with Newey at Williams in 2013 2014 Williams would have won.